Ever since she got married, Tonto Dikeh-Churchill has been so full of love for her husband and child. The actress who keeps celebrating the loves of her life has just revealed her 'baby' has gotten her the iPhone 7 Rose Gold. She shared a photo of the newly released phone writing, "Always wanted A pink phone. Thank You Baby... #Iphone7." 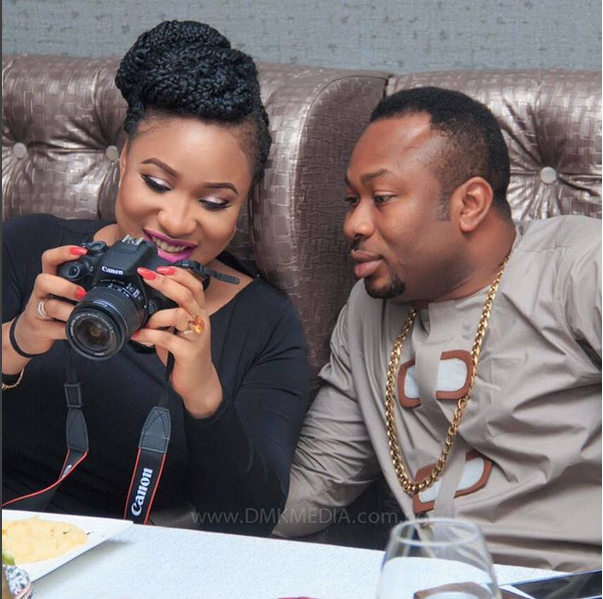 Meanwhile, Tonto Dikeh and her partner, Oladunni Churchill celebrated their first wedding anniversary on August 29, 2016. The actress took to Instagram today sharing photos from their wedding while gushing over her "Sunshine". She wrote, "How time flies when you are in Love and having fun with your Soul-Mate.. It's been a Splendid 1year of being your Wife..
Am lost for words to describe how I feel about you MY BABY. You have been A great friend and thought my that friendship isn't measured by how long you've known each other BUT how beautiful Life has been knowing you are part of their Life. My Life has been greatly decorated since I met you,You strive for me to be a better person everyday of your life and that's something that amazes me.. I deserve you,I deserve all of the Love, Care & friendship we Share..I deserve the Life I have with you,We are blessing to each other.. Thank you for being My Man,I LOVE YOU TO THE MOON AND BACK. You are my Sunhine and my Everything..Loving you is like Food to my Soul.I appreciate you my KINGKONG.."